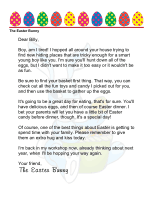 The Easter Bunny wants to reassure a nervous new older brother or sister in this printable letter. 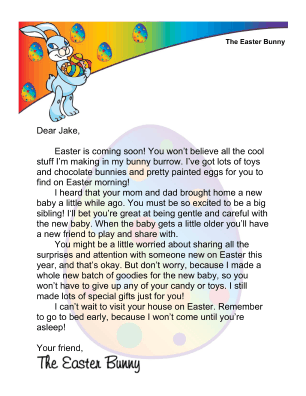 The rabbit reassures the child that their new sibling will not get their toys and candy, and that the bunny still has lots of special treats for everyone. It can be mailed a few days before Easter. Easter is coming soon! You won't believe all the cool stuff I'm making in my bunny burrow. I've got lots of toys and chocolate bunnies and pretty painted eggs for you to find on Easter morning! I heard that your mom and dad brought home a new baby a little while ago. You must be so excited to be a big sibling! I'll bet you're great at being gentle and careful with the new baby. When the baby gets a little older you'll have a new friend to play and share with. You might be a little worried about sharing all the surprises and attention with someone new on Easter this year, and that's okay. But don't worry, because I made a whole new batch of goodies for the new baby, so you won't have to give up any of your candy or toys. I still made lots of special gifts just for you! I can't wait to visit your house on Easter. Remember to go to bed early, because I won't come until you're asleep!